The range of the bactrian camel is central Asia to Mongolia. The bactrian camel inhabits dry steppes and semi-desert. Gestation in the bactrian camel is 12 to 14 months. Bactrian camels produce 1 calf. Bactrian camels live in the Gobi steppe along rivers and move into the desert as soon as the snow melts. They can stand extreme heat and cold and are good swimmers. They can travel carrying 375 to 600 pounds at 3 or 4 miles per hour for 4 or more days. Their urine is concentrated, and their dung is so dry it can be used as fuel as soon as deposited. They can store up to 80 pounds of fat in the hump. The hump shrinks as this fat is used. Food is not chewed completely before swallowing. They bring up partly digested food, called cud, and chew it, then swallow it again. Their mouths are tough enough that they eat the thorniest plants without injury. They can drink brackish water if they have to, and will eat fish when hungry enough. They can drink as much as 30 gallons of water in ten minutes. 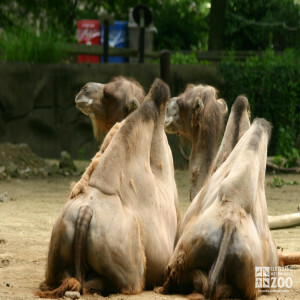 Camels live in groups of up to 30. When rival males meet, they display by urinating, defecating, tail slapping, and spreading hind legs. If these measures are ineffective, mortal combat may ensue. Camels have no enemies. Bactrian camel females give birth in March or April every other year. Offspring weigh 75 pounds at birth and can walk after one day. They will nurse for 1 or 2 years and will mature in 3-4 years if female and 5-6 years if male. Mating is preceded by the male blowing up an extension of its soft palate into a red “balloon” that hangs out of the side of the mouth and arouses the female. Females are sitting during mating. Males have periods of reduced sexual activity and often give up herd leadership at such times.